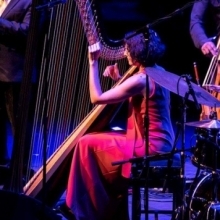 Alina Bzhezhinska - Lincoln Jazzpac Bzhezhinska is an internationally renowned harpist. Alina’s critically acclaimed Quartet led the 80th Birthday celebrations for Alice Coltrane around the UK in 2017. Their appearance at the EFG London Jazz Festival in a special triple bill featuring Denys Baptiste and Pharoah Sanders - 'A Concert for Alice and John' - has been nominated for Best Live Experience of the Year at the 2018 Jazz FM Awards.